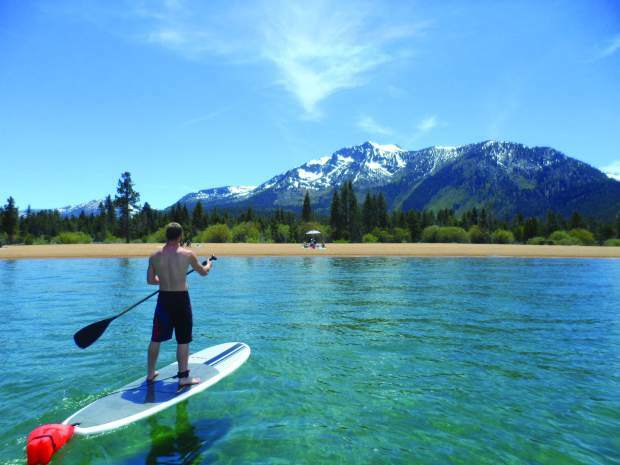 Stand-up paddleboarding, or SUPing, has exploded in popularity recently, and more and more people in the Vail Valley are getting into it. SUPing can be a wonderful form of exercise that focuses on core and upper body strength, and it’s accessible to everyone from Class IV whitewater adrenaline junkies to those looking for a new way to practice yoga on the water. However, as with any recreational activity, there are some risks involved. As more people have taken up SUPing in its various forms, we’ve seen an injury pattern develop specific to the sport, mostly affecting the shoulders, elbows and back. So, what can you do to help prevent injury when you take to the rivers and lakes to enjoy a good paddle? Good technique is imperative. It is important to be conscientious about your paddle sweep and your body position on the board to maintain safe posture. Balancing on the board can be a challenge in itself for some participants, and when you add in the paddle sweep, it is easy to twist the back or overreach with the arms and shoulders. In order to help prevent strain, try to paddle in conditions that are appropriate for your ability, so you can develop the strength, balance and flexibility that will help prevent injury. Additionally, we recommend a warmup before every paddle. These activities don’t take long and should be performed before you ever step on the board. A simple warmup should include legs, back, shoulders and arms. As always, when warming up, start gentle and easy so as to not put too much strain on a tight body. You can use your paddle to help you stretch, by pressing the paddle overhead gently to stretch the shoulders, and placing it across your shoulders and performing gentle spinal twists. To warm up the hips and legs, perform a few gentle squats, press the paddle overhead while performing forward lunges and use the paddle as a support while performing leg swings and ankle circles. Once everything feels like it is moving fluidly, you are better prepared to jump on and have a safe paddle. While SUPing may look like an easy float to some people, remember that it can be a demanding sport. By paddling in conditions appropriate to your strength, balance and flexibility, and by always performing a healthy warmup, you can help minimize your risk of injury while enjoying this amazing sport. We hope the rest of your summer is filled with fun, injury-free, times out on the water. Devyn Parnes is a physician assistant with Dr. Rick Cunningham’s office. Cunningham is a knee and shoulder sports medicine specialist with Vail-Summit Orthopaedics. He is also a physician for the U.S. Ski Team. Visit his website at http://www.rcunninghamorthopedics.com. For more information about Vail-Summit Orthopaedics, visit http://www.vsortho.com.